The British Museum exhibit on the Assyrian King Ashurbanipal has been a tremendous success and critically acclaimed. The Assyrian community worldwide has taken great pride in having its culture on display. The exhibition fails, however, to mention that Assyrians still exist. The Assyrian Confederation of Europe, an umbrella organization representing more than half million Assyrians in Europe, issued the following statement regarding this point. On the second of February, Attiya Gamri, President of the Assyrian Confederation of Europe, visited the exhibition I Am Ashurbanipal, King of the World, King of Assyria, organised by the British Museum in London. 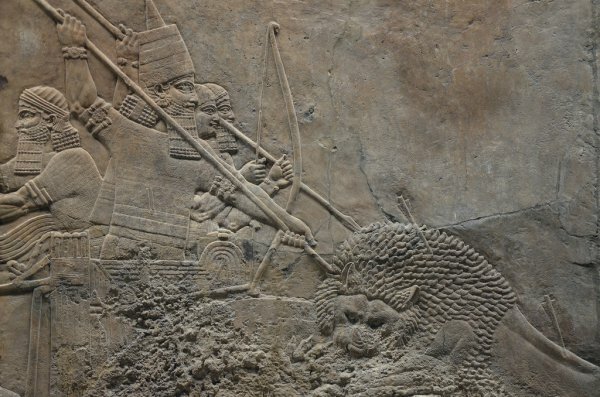 The exhibition discusses the legacy of this great Assyrian king and of the Assyrian empire. Ms. Gamri was accompanied by a cohort of fifty other Assyrians, who gathered from across Europe to attend the exhibition. This visit was coordinated by the Assyrian Confederation of Europe and by the Assyrian Federation in the Netherlands (Assyrische Federatie Nederland). The group came together to celebrate their shared Assyrian heritage and to appreciate the British Museum's dedicated work. Although I am Ashurbanipal does an excellent job of discussing the rich history of Assyria, it does make one vital omission that is of concern to the Assyrian Confederation of Europe. Crucially, the exhibition fails to mention the continued existence of the Assyrian people. Though the Museum is providing external programming related to modern Assyrian culture, this information is not presented anywhere in the exhibit itself. It is entirely understandable that the museum's work would be primarily focused on history, rather than contemporary Assyrians. However, as representatives of a persecuted and globally marginalised community, the Assyrian Confederation of Europe notes that even a cursory mention of today's Assyrians would have served a key educational purpose. Such information is vital to our ongoing struggle and threatened identity. It is the position of our organisation that the British Museum has neglected its important role in this conversation.